This hidden treasure is an amazing opportunity to own a beautiful property on a quiet cul-de-sac with only 3 other homes. It is over 1600 sf and sits on almost an acre of land that backs up to the Nipomo Creek. This home has been completely restored and remodeled with fresh paint on interior and exterior, new flooring throughout and many extra features. 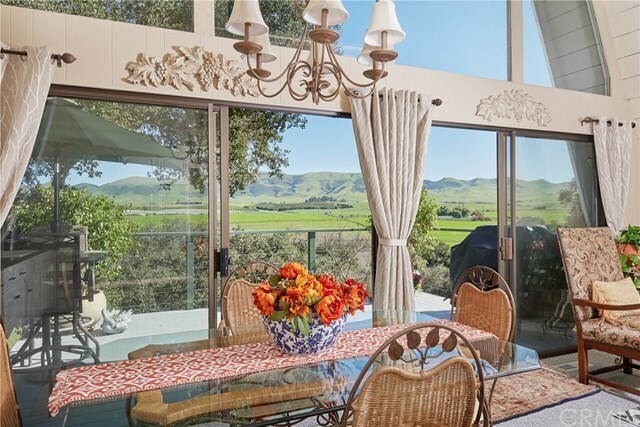 The outside patio(s) and deck offer uninterrupted panoramic views of the fields and hills and are great for entertaining, enjoying mother natureâs best or just relaxing in Nipomoâs beautiful weather. There are established fruit trees, a detached extra-length open garage and 3 outdoor storage sheds. Bring all your hobbies and toys because there is lots of room for RV/trailer parking, gardening and 4-H projects. Water and sewer provided by local NCSD. A check with the County revealed an opportunity to build an 800-sf or less guest unit or shop within 50 ft of the main residence. Make this your forever home with all its possibilities for living the good life. Information deemed reliable but not guaranteed.